Card calendar printing is a handy way to have your brand right in front of a customer. Unlike most other giveaways, calendars are actually appreciated by everyone. The 2”x 3.5” size is the same as a business card, and just like a business card, they easily fit into a pocket or wallet, making them convenient to distribute. 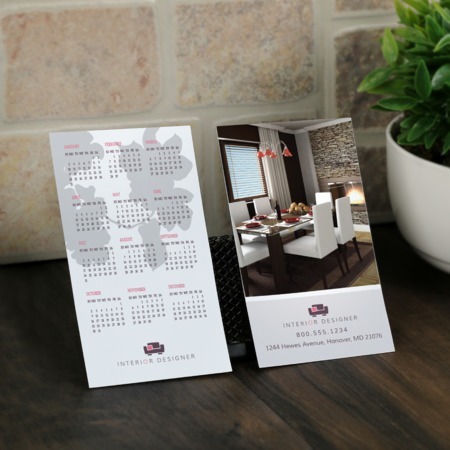 Depending on how you intend to use them, they can also be configured as small, but striking photo calendars or business calendars, highlighting specific dates.The best part about card calendars is that they keep making brand impressions for an entire year. Print card calendars from your choice of stocks. Use thicker, heavier stock for durable pocket calendars, or thin quality stocks for general purpose mini calendars. Our standard sizes are perfect for creating compact wallet calendars, but we also offer custom sizes if you need smaller or larger options. Card calendar printing is simple. No need to figure out how many days each month has. Simply download free card calendar templates to get started making accurate card calendars. Our online design tool makes it even easier, letting you create card calendars on your own. If you need to make your card calendars even more special, contact us and we can help you make it happen.